Winter parched skin will love Live Clean Sheer Light Skin Perfecting Dry Body Oil! 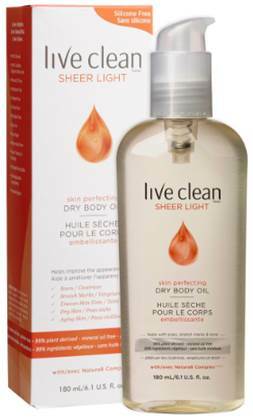 Live Clean Sheer Light Skin Perfecting Dry Body Oil - 180ml - $9.99 - offers a high level of moisturization in an advanced, skin-perfecting formula with their Natura8 Complex - containing a blend of certified organic oils including: safflower oil, argan oil, jojoba oil, coconut oil, avocado oil and sesame oil along with moisturizing vitamin E and skin nourishing vitamin C - that calms irritated skin, improves the appearance of scars, stretch marks, redness and dark spots; helps increase the skin's elasticity and resilience; helps minimize the appearance of fine lines and wrinkles - all in a super light oil that smells great, has a smooth silky finish and disappears into the skin leaving dry winter skin with a refreshed summer glow. Available now at Walmart and Loblaws stores across Canada.